Adpated from Phil Deffina, Highpoint Bistro & Bar in New York. Carve a 1½-inch-thick slices from the center of a seedless watermelon and marinate in white balsamic vinegar for at least 4 hours, preferably overnight. Before grilling, season each slice with sugar and a generous amount of ground black pepper (up to 1 TSP per slice; including a combination of ground black pepper, pink peppercorns and grains of paradise). Grill over direct high heat for about 3 minutes, on one side only. 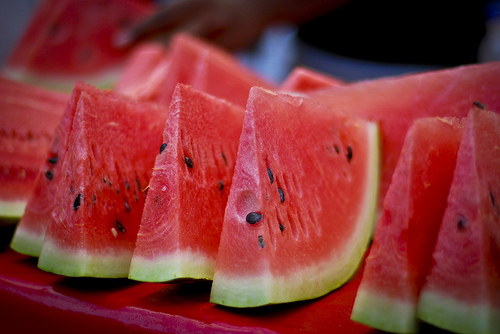 The watermelon should turn bright red and become caramelized on the grilled side. Serving suggestion: over steak salad with shaved jicama, blanched asparagus tips, radishes, tarragon, chervil and olive oil, salt and pepper.